I don't think I've heard of a single person that doesn't hate mosquitoes. They bite you, they steal your blood and then leave an itchy red bump behind. Here in Gabon we take mosquitoes seriously. 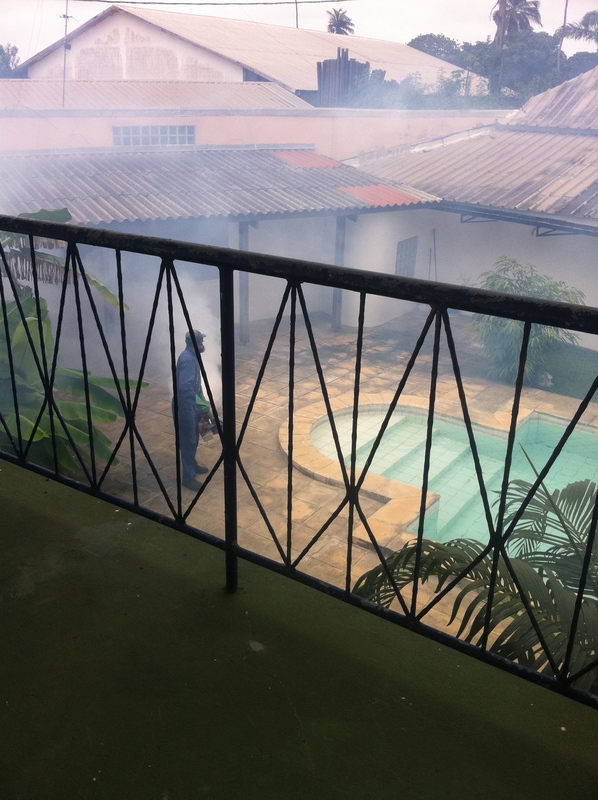 Once a month an extermination company comes to our house to spray the yard and the interior of the house. This stuff is bad - I stay in the house with the windows closed and the air conditioners off and it still manages to seep in through the tiny little cracks and before long, the room is looking smoky. It penetrates your lungs and forces you to cough and you can tell, this stuff is not good for you. However, malaria is also not good and Gabon is considered a high risk zone. People here don't worry about the environment nor the health risks of the chemicals used in spraying because if you get malaria and it goes untreated, you won't be around to worry about those things. Sorry for the terrible photo quality - I didn't want to stick around outside to get the shot. Joe and I no longer take Malarone. Actually, we really only took it for the first month or 2 that we lived here. It's really hard on your body and I felt sick every single morning after taking it. It's also meant to be for short term use and the long term effects have yet to be tested so because we live here year round, we decided to forgo it. Instead, we wear mosquito spray whenever we go out at sunrise or sunset and we continue to spray our yard with harmful chemicals. Either way it's a win-lose situation.